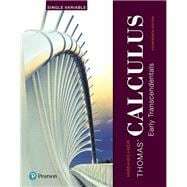 Thomas' Calculus: Early Transcendentals, Single Variable helps students reach the level of mathematical proficiency and maturity you require, but with support for students who need it through its balance of clear and intuitive explanations, current applications, and generalized concepts. In the 14th Edition, new co-author Christopher Heil (Georgia Institute of Technology) partners with author Joel Hass to preserve what is best about Thomas' time-tested text while reconsidering every word and every piece of art with today's students in mind. The result is a text that goes beyond memorizing formulas and routine procedures to help students generalize key concepts and develop deeper understanding.